Wing walking, at one point, was one of America’s most popular events. It was the 1920 version of a David Blaine stunt, in which people would walk or move on top of a moving biplane. As it turns out, not only are people still doing this, they’re still breaking records in the process. 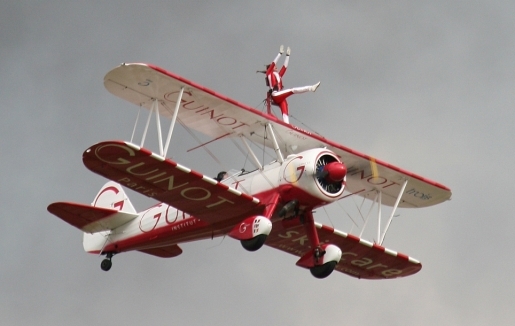 Tulsa, Oklahoma’s Ashley Battles took to the wing of a biplane over San Francisco, spending four hours defying death armed only with her iPod and her dancing shoes, breaking the Guinness World Record for wing walking. The previous record, held by a Frenchman, was 3 hours 23 minutes. Battles took off and landed at Gnoss Field Airport in Novato, California. When she’s not walking on wings, she attends Oklahoma State University.